NES Gargoyle's Quest II (USA) in 27:43.08 by goofydylan8. A long time ago, before human being appeared, there lived a monster named Firebrand. 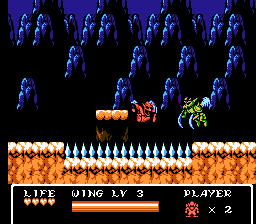 In this game, Firebrand (the red gargoyle) fights against the evil that has invaded his homeland. Along the way, he becomes more powerful and becomes able to fly longer, jump higher, and shoot more weapons. goofydylan8 conquers this game in a little under 28 minutes with careful lag management, damage-boosting, and aggressive boss fights. TASVideos also has movies of this game's prequel for the Game Boy and sequel for the Super NES.